The Cavanagh Altar Bread brand low gluten hosts have been approved by the United States Council of Catholic Bishops. 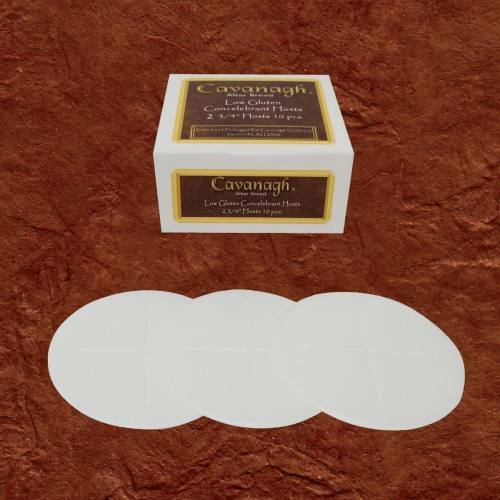 The Cavanagh Company Low Gluten Altar Bread is valid matter for use in the Catholic Eucharist according to the Catholic Church's canonical requirements. The gluten content of the Low Gluten Altar Bread is under 20 parts per million. All hosts are non returnable. These breads are packaged in bags of 10 and placed in a box, which is then sealed with a label. As with all Cavanagh products, they are untouched by human hands before being packaged. Generations recommends consulting a doctor or medical professional before using Low Gluten or Gluten Free hosts, if your medical situation requires such products. Generations is not responsible for any medical advice, consultation, or reaction to the use or consumption of Gluten Free or Low Gluten hosts. PLEASE CONSULT A DOCTOR BEFORE USE. Generations is proud to be a distributor of Cavanagh Altar Bread, the best and highest quality Altar Bread available. For over 50 years, Cavanagh has proudly provided quality altar bread to countless churches the world over. All Cavanagh hosts are made of only pure wheat flour and water, strictly without additives, and have a carefully molded sealed edge which prevents crumbs. Cavanagh hosts are produced in the United States in an exceptionally clean and modern automated facility. Throughout the entire production process the hosts remain untouched by human hands and are packaged just moments after baking. Shop and save! Generations Religious Gifts & Church Supply has the BEST prices on Cavanagh Altar Bread available. Shop locally and nationally and see that we beat all catalogs and competitors.